Most of the time I'm more enthusiastic about eating cookies than baking them. My brain doesn't like too much repetition, and I've been known to exile half batches of cookie dough to the freezer just because I'm too bored to finish the job. Having said that, there is one type of cookie that delights me to the very end: Slice and bake. These marbled coins are the opposite of boring! Each cookie is unique. It's like getting a different piece of artwork every time you slice the dough. Not only that - I appreciate the swift work of slice and bake cookies, especially around busy holidays. Silver dragées can be pressed in the centers of each cookie while they are still hot from the oven. This adds a little holiday sparkle, but it's an optional step. Sugar pearls look just as pretty if you prefer to use them instead. I think they look best packaged in clear cellophane bags tied with simple baker's twine or ribbon. In a stand mixer fitted with the paddle attachment, mix the butter and sugar together until just incorporated. Do not over-mix at this stage, or the cookies may spread while baking. In a medium bowl, whisk together the flour and salt. Add to the butter and egg mixture. Mix on low speed until a dough is formed and there are no longer any streaks of butter in the mixing bowl. The dough will often clump around the paddle attachment while being mixed. This is normal and a good sign that your dough is the right consistency. If your mixture does not come together and is crumbly, add ice cold water 1 tbsp. at a time until the dough clumps. Turn the dough out onto a sheet of wax paper. Divide in half. 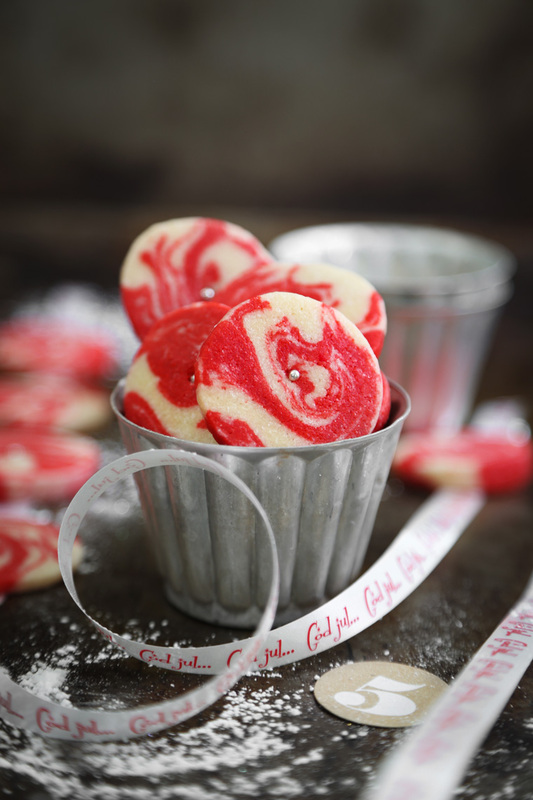 Return one half of the dough to the mixing bowl and add the peppermint extract and 1/2 teaspoon gel food color. Beat until well combined. Add more food color if needed to create a deep red hue. If the mixture becomes sticky, add additional flour 1 tablespoon at a time until it can easily be handled. Shape the red dough into a ball; shape the white dough into a ball. Cut each ball in half. Briefly knead one white portion and one red portion together – do not over mix. Only knead until the dough is combined and there are definite swirls of red and white color. Roll into a log and wrap in waxed paper. 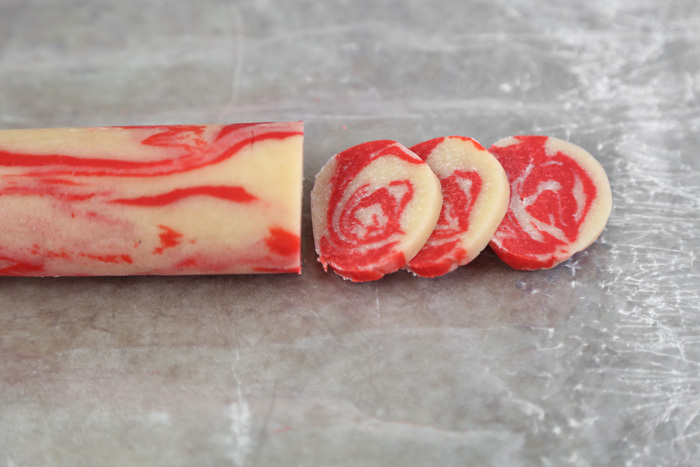 Repeat with the remaining red and white dough portions so that you have two marbled dough logs. Refrigerate the cookie dough logs until firm, about 30 minutes. Line one or more large baking sheets with parchment paper. Cut the chilled cookie dough into coins about 1/4 inch thickness and place them on the cookie sheets 1 1/2 inches apart. Refrigerate the cutouts for 10 minutes. This will help the cookies maintain a crisp shape during baking. Let the cookies cool on the baking sheet for 5 minutes. Transfer to a wire rack to cool completely. Store cookies in an airtight container, or package them for gift-giving. These are such pretty cookies. I love that swirl. Slice and bake cookies are the bomb. 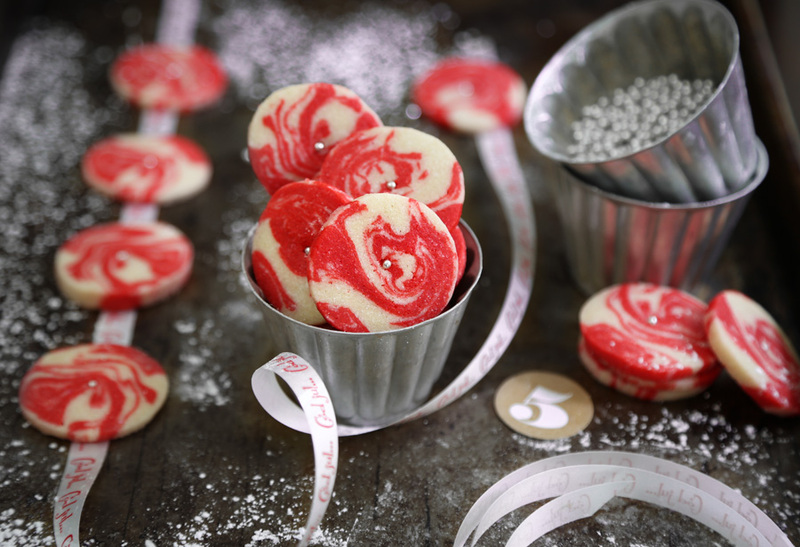 Red and white cookies! They look great, ideed! Can I premise them and freeze for later baking?